Introduction: Observational studies indicate that cigarette package inserts with efficacy messages about the benefits of quitting (i.e. response efficacy) and recommendations for successful cessation increase smokers’ self-efficacy to quit and promote sustained cessation. However, the effects of inserts with such efficacy messages have not been studied using experimental designs. This study used ecological momentary assessment (EMA) to assess smokers’ responses to efficacy inserts. 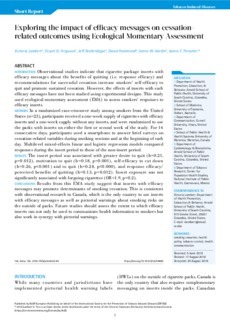 Methods: In a randomized case-crossover study among smokers from the United States (n=23), participants received a one-week supply of cigarettes with efficacy inserts and a one-week supply without any inserts, and were randomized to use the packs with inserts on either the first or second week of the study. For 14 consecutive days, participants used a smartphone to answer brief surveys on cessation-related variables during smoking sessions and at the beginning of each day. Multilevel mixed-effects linear and logistic regression models compared responses during the insert period to those of the non-insert period. Results: The insert period was associated with greater desire to quit (b=0.21, p=0.012), motivation to quit (b=0.18, p=0.001), self-efficacy to cut down (b=0.26, p<0.001) and to quit (b=0.28, p<0.000), and response efficacy/ perceived benefits of quitting (b=0.13, p=0.012). Insert exposure was not significantly associated with forgoing cigarettes (OR=1.9, p=0.2). Conclusions: Results from this EMA study suggest that inserts with efficacy messages may promote determinants of smoking cessation. This is consistent with observational research in Canada, which is the only country to use inserts with efficacy messages as well as pictorial warnings about smoking risks on the outside of packs. Future studies should assess the extent to which efficacy inserts can not only be used to communicate health information to smokers but also work in synergy with pictorial warnings.